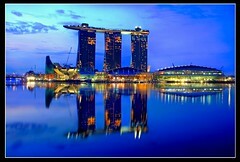 The Marina Bay Sands (MBS) was declared fully opened by Prime Minister Lee Hsien Loong. The MBS Integrated Resort (IR) had its soft launch April 2010. Revellers at the Bayfront Promenade and Event Plaza was treated to a water and light show which premiered at 8:08pm on 17 February 2011. Marina Bay Sands has a gaming area of about 15,000 square meters which is less than 3 percent of the entire integrated resort’s gross floor area. The casino have almost 500 table games and 1,600 slot machines. There are three levels of gaming floor-space and over 1600 slot machines (Jackpots) and 500 table games which have 6 different game types (Baccarat, Blackjack, Roulette, Sic Bo, Singapore Stud Poker and Money Wheel). A combination of a dealer and live game with an electronic betting interface, Rapid Table Games offer an exciting gaming experience. Gamblers can make their wagers on the computerized table game layout and all wagers and cash balances are instantly resolved after each round is completed.